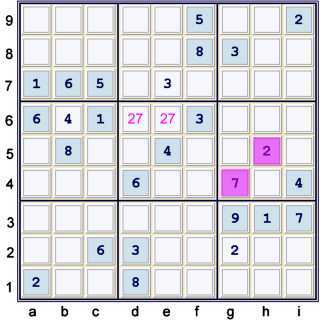 The following is an illustrated proof for the Tough Sudoku of March 27, 2007. The primary key used in this proof is, once again, Y wing styles. You may need to refer to previous blog pages to understand this proof. Links to these pages are found to the right, under Previous Entries. At many times during this illustration, there are other steps available. It is not the goal of this page to show every possible step, but rather to illustrate steps that, taken together, unlock this puzzle. 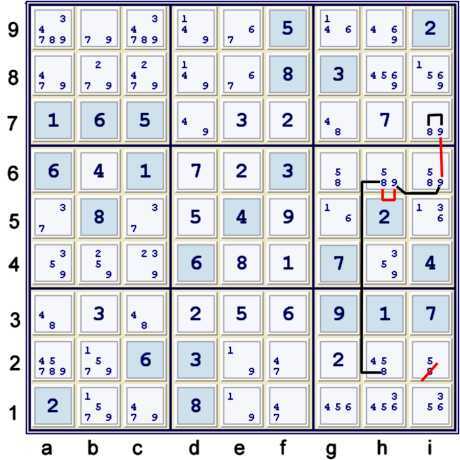 Since abcf6 are already solved, and both 2 & 7 are located in box h5 outside of row 6, without considering the possibility matrix, one can limit cells de6 to only candidates 2,7. Once again, sans possibility matrix, the hidden pair 19 exists at e12. This is due to the solved cells d12, gh3, f45. Limiting e12 to only candidates 19 causes a cascade of Unique possibilities leading to 38 cells solved. Start the cascade with e3=5% box and column. Finally considering the possibility matrix, there are many possible paths to take. One can use a group of standard easy techniques to advance the puzzle a bit further. This page illustrates only two more steps that are sufficient to completely unlock the puzzle. Above, since candidate 8 is limited to only gi7 in row 7, and since both gi7 are in box h8, 8 cannot exist in box h8 outside of row 7. One can write this easy step as a forbidding chain or Alternating Inference Chain (AIC>. One can alternatively consider the possible 8s at ac9 to eliminate the same 8s at gh9. The puzzle is now nothing more than hidden and naked singles to the end. Illustrated to the left, instead of the Y wing style illustrated, one could have used a Very Common Y Wing Style. These are easier to find than even the standard Y Wing - except that most computer aided sovlers will not find them for you! Both column g and i have a cell limited to only candidates 58. All one needs is a strong link in either 5s or 8s to connect the dots. Here, column h has such a link in 8s, thus eliminating the 5s indicated. After these 5s are eliminated, the puzzle is again solved using only Unique Possibilities. I see such Very Common Y Wing Styles often. They do not make it into the final proofs that I submit as often, since there often exists a more efficient manner to solve the puzzle. Nevertheless, if one is solving for speed, these are so easy to spot, they should be added to one's toolbox. 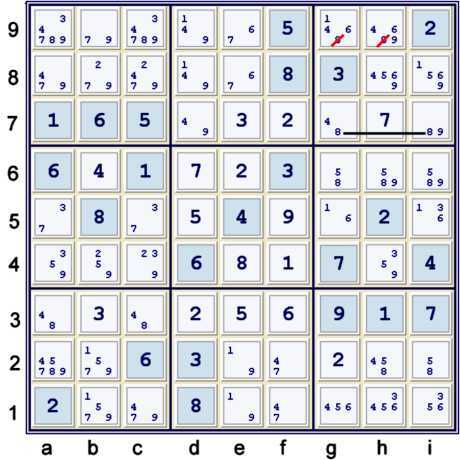 Unfortunately, I suffer from the same confusion when I try to read about sudoku at other sites. The naming conventions used at most other sites are different than the ones that I learned here. A different solution path can be found by using the bilocal 9s in box h8, which result by using the hidden pair 16 at i58. Only simple steps are necessary after the AIC d7=4 == d7=9 -- i7=9 == h9=9 -- h6=9 == h6=8 -- g6=8 == g7=8 => g7<>4 is used.